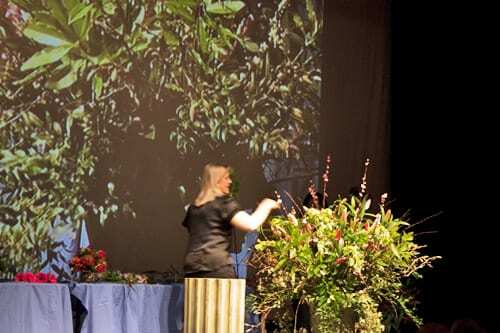 On Wednesday, I was delighted to attend a floristry demo by Paula Pryke at the Yvonne Arnaud Theatre in Guildford. 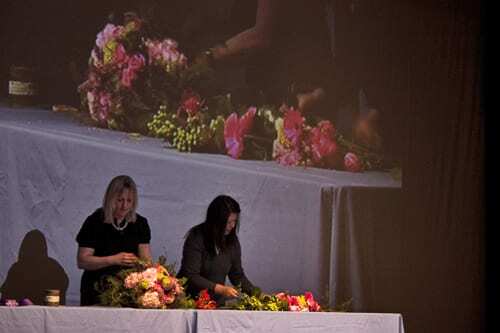 It was one of two demos which Paula was doing that day to promote the Guildford Cathedral Flower Gala, which takes place this June. 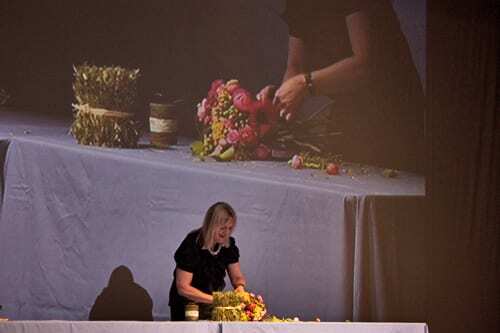 And she certainly wowed the audience with her stunning floral designs and the speed at which she constructed them! 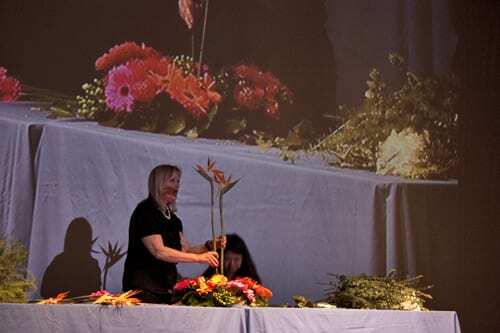 Paula started off with a mixed hand-tied bouquet (above and below) of orange gloriosa lilies, red roses, yellow achillea, guelder rose, dark purple calla lilies, hypericum, berried ivy, camellia and ‘Baby Blue’ eucalyptus. 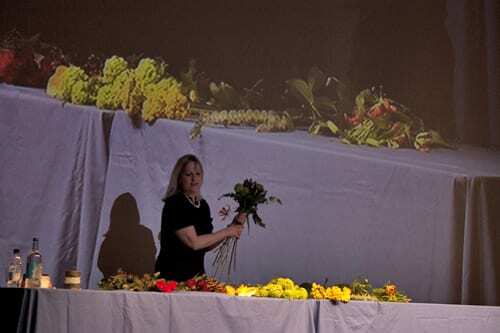 She then made a grouped hand-tied bouquet (below), placing the flowers in individual groupings for a contemporary look. ‘Aqua’ pink roses, lilac, pale pink hydrangeas and guelder rose were used with a collar of coral ferns. 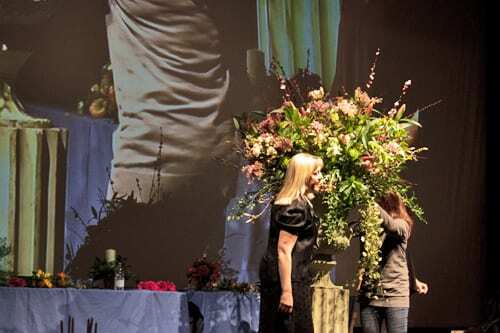 Paula is very well-known in the floristry industry for her amazing use of colour in her designs. But she’s also known for customising her containers too. She explained how to cover a glass vase with rosemary and then made a hand-tied posy to place in it. 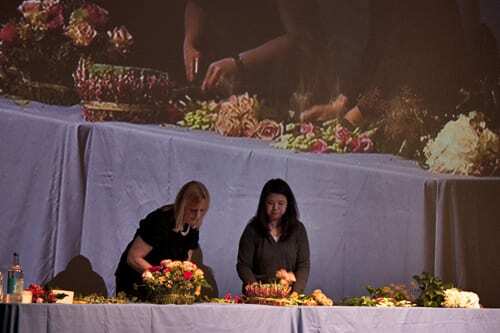 She also demonstrated how to make a ‘birthday cake’ design using floral foam, flowers, foliage and candles. The container, this time a plastic pot, was again decorated with rosemary. But she also showed us an example of a dish which had been decorated with heather. 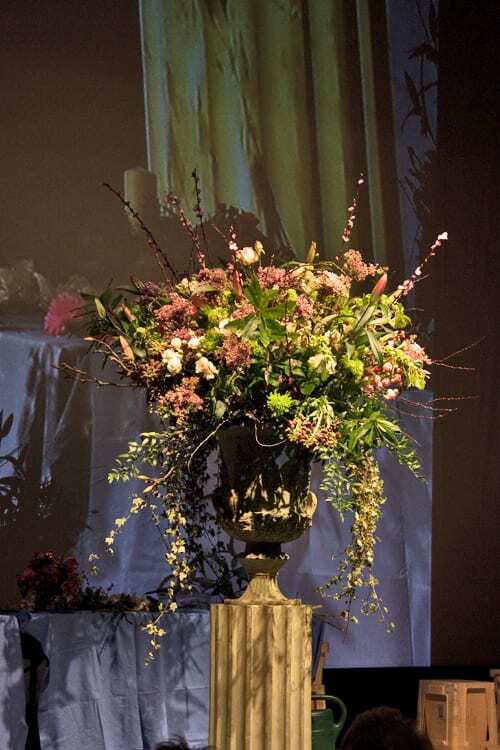 The next design below was a floral arrangement suitable for a tablecentre at a wedding. Succulents, which are currently very popular, were wired on to a basket together with air plants. Then Paula placed a plastic dish with floral foam into the basket. 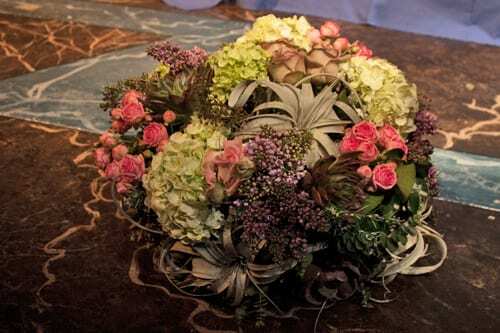 She used taupey lilac roses, pink spray roses, lilac, hydrangeas and foliage, plus more succulents and air plants. She then showed us some simple vase arrangements including single stems of white slipper orchids placed in individual green bottles on a silver tray. 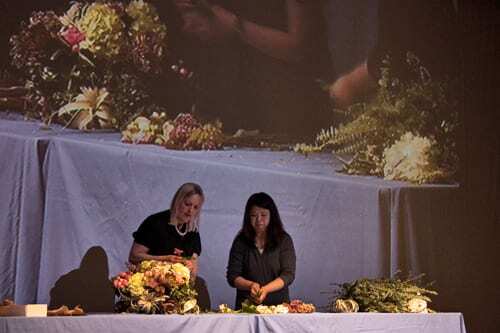 And she showed us below how to make a table arrangement using flowers grouped in a floral foam ring. She used gerberas and leucospermum, plus hypericum and galax leaves. In the centre, she placed a pin holder into which she placed strelitzia. The finale was wonderful…a huge pedestal design created to music in six minutes flat! 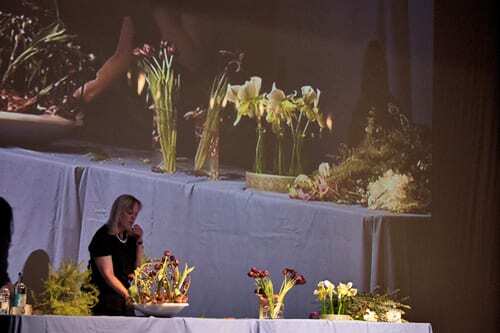 Paula used a variety of foliage, roses, lilies, shamrock chrysanthemums, lilac, blossom and fritillaria. 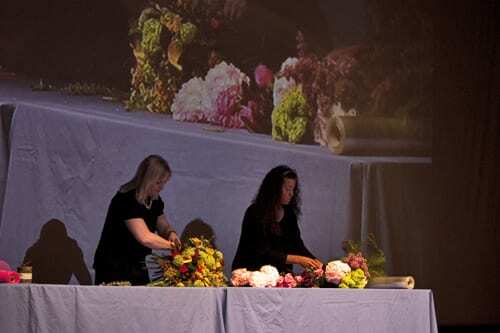 The whole way through the demo, Paula gave us lots of hints and tips, plus details about current floral trends. Some very happy ladies left the theatre that afternoon, especially the ones who’d won the raffled flower arrangements featured in this blog post. I’m planning on writing a separate post about the Flower Gala which takes place in June. 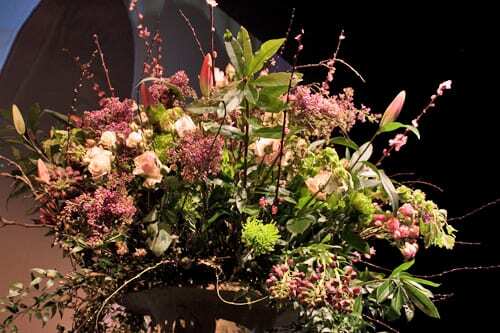 It’s going to be the happening floral event of 2013! But in the meantime, do pop over to the website. 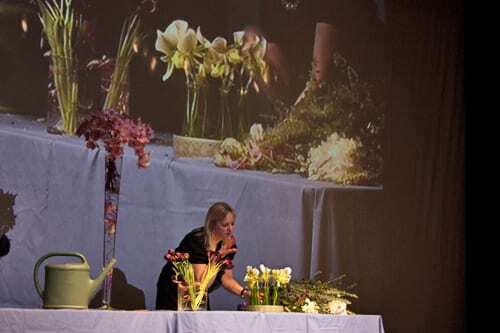 There will be more floristry demos at the Gala. This time by Robbie Honey, Shane Connolly and Joe Massie. P.S. If you receive your Flowerona blog posts via email, I’m very sorry that you may not have received one yesterday. There was a problem with the Feedburner service which I use, which is hopefully now rectified.